In an unheard of turn of events, I went out last night. It was to see a local cover band that I had heard about through friends. Turns out they are really, really good musicians and, possibly more important for a cover band, they are pretty great showmen. They have a schtick, certainly. But it works. And judging by the fans in attendance and their loyal following on Facebook, covering songs is working for them. I fully enjoyed their rendition of "In Between Days".I know that I had fun last night because I awoke hungover and with a stomach ache. It has been awhile since that's happened but if memory serves, that's an indication of a decent time out. I haven't gotten too much accomplished today, my one day completely off for awhile. I cleaned my kitchen, got rid of some stuff. A few weeks ago I bought Krazy Glue for the first time ever and I've been applying it to everything. Doorknobs, umbrellas, my cat. I finally got around to fixing a pendant that broke last year in Madrid when it was yanked from my neck as I leaned over the balcony of our apartment to see the street below. That was a five story drop and I raced down to the street to get it. I think I held on to it this whole time because I was just so impressed that I was able to find it on that cobblestone, high traffic street. Thanks to old krazy glue, it is fixed. 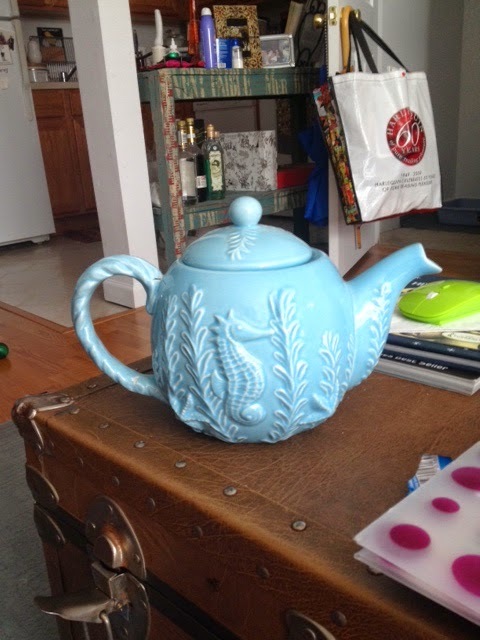 I also got around to fixing a teapot, gifted to me by my mother, that my cats had knocked over about three years ago. I am the opposite of handy and generally, when something breaks in my apartment, I hold onto the pieces "just in case" I find within myself the urge and the impetus to fix it. Even on the rare occasions when that does happen, I end up totally unable to follow through, either through laziness or total ineptitude. So when I do end up being able to piece together something that was once broken, I feel so damn good. I get so proud of myself in the exact way that a kindergartner does when she crafts a turkey out of the traced silhouette of her palm. Art! Behold the beauty below. In case you were wondering, Krazy Glue is not the sponsor for this post. I just wanted to chronicle a lazy, hungover afternoon during which I was able to fix things. I admit that the world outside my apartment door is a little overwhelming at the moment. It is nice to be able to slap some glue on something in pieces and to have it be mended. It is exactly like a knuckle crack: satisfying and relieving, sometimes accompanied by a sigh. I did venture out briefly to print up copies of my writing portfolio. The shop I went to was freaking bananas with harried parents and their sleepy eyed kids, piling school supplies into their carts. My trek into the store only lasted about 10 minutes but I was getting stressed out among all those damn kids. Damn kids and their futures ahead of them with their healthy pink lungs and all brain cells accounted for....damn kids. I think it may be time to lie down for a bit. Happy Sunday. congrats on fixing your stuff. I admire that because I tend to want to throw things away when they break, after some undignified crying of course. Jeff likes to fix things and has accumulated a whole collection of glues, one for each job. Good for him. It takes me forever to get to projects, though! May as well just throw them out and save room!